THIS DRESS SOLD. CONTACT SALES@BRIDESFORACAUSE.COM WITH DRESS INQUIRIES. This body hugging lace mermaid wedding dress with a keyhole back was donated by a bridal store, so its a sample with original tags attached! 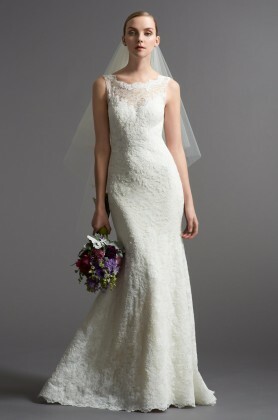 The designer is TWD Private Label by Marissa, style #953, the "Whitney" dress! The gown is in excellent condition! Size 10.